A well-armed population has the power to stop tyrannical governments. Our country was founded by such a battle, where a well-armed population succeeded in stopping tyranny and founded a government of the people. Governments will inevitably abuse their power, and we must be ready to overthrow the government as a last resort to protect liberty. Without guns, we are powerless to prevent government overreach. It is worth noting at the outset that this fear of tyranny suddenly arising belies a fundamental misreading of how authoritarian regimes actually come to power. Namely, it assumes a false dichotomy between “the people” on one side and “the government” on the other. Government is not some foreign entity imposed on the people, which would only arise from a foreign country conquering the United States (not going to happen). Rather democratic government is derived from the people. A tyrannical government could only arise in the US with a majority of the population supporting it due to some economic or military crisis: in reaction, say, to a heavily armed minority attempting to enforce its will on the rest of the country. Government does not just “suddenly” become tyrannical. The debate should just end here. However, given that this a blog dedicated to thoroughly debunking myths, I will delve deeper. The founding fathers were wrong. Blasphemy, I know. Yet the idea that Militias are in anyway necessary or good for a free State has no historical justification, especially in the modern era. Militias (especially unregulated ones) are overwhelmingly detrimental to the existence of a free society, and at best are impotent in its defense. A historical analysis reveals that Militias are typically the gateway to tyranny, not the safeguard against it. A heavily armed population has little to no bearing on preventing tyranny. Our own Revolutionary War shows militias are effective at protecting liberty. Armed populations deter tyrants while unarmed populations are defenseless. Disarming a population is the gateway to genocide. All of these arguments are false. Let’s first look at our own Revolutionary War. The idea that militias are the bulwark against tyranny typically begins in a faulty reading of American History. The Revolutionary War was not won by Militias, but rather the Continental Army with considerable help from the French. While it is probably an exaggeration to suggest that the Militia was completely worthless during the War, that is far closer to reality than the myth promulgated by some pro-gun advocates. And the Militias that did significantly contribute to the cause were organized by the states and represented a well-disciplined, cohesive fighting force that mirrored the Continental Army, not the minutemen of lore. Moving to the modern era, Militias have a terrible history of creating tyranny, even when fighting against foreign powers. Militias that have been successful in warding off foreign aggression overwhelmingly opposed democratic rule. A few examples are Vietnam, Afghanistan, Cuba, Somalia, Iraq, and southern Lebanon; in none of these countries did the militias promote a free State. Add to this list countries where militias have ripped apart society in tribal states or civil war (such as Pakistan, the Democratic Republic of the Congo, Mali, Colombia, and the Palestinian Territories) and we can form an even clearer picture of militias. For a more immediate example, one only has to look at the bewildering array of militias (more than “1,000” according to Robin Wright) currently fighting in Syria to see how little they promote democratic values and how ineffective they tend to be on the battlefield. While there may be an example of victorious militias replacing tyranny with freedom since the industrial age hiding somewhere in an obscure footnote of history, the rule that militias are detrimental to preserving freedom holds. An astute reader will note that all of the examples I am providing are from poor countries or societies that never had a well-established democratic tradition. And this is true. While it is typically wise to refrain from comparing countries in different socio-economic strata, there simply aren’t any wealthy, free societies that use militias for self-defense. Every democratic country, with the exception of Costa Rica, has a standing army to defend it, not militias. For examples closer to home, we can easily see that the Klu Klux Klan, Neo-Nazi elements, and the Black Panthers (all of which are or were unregulated militias) have done little to promote a free society. Perhaps the best example in America of the influence militias have on society is “Bloody Kansas” during the 1850s. Pro-Northern and Southern settlers, armed to the teeth, streamed into Kansas in order to sway whether the state became free or slave. The constant skirmishes killed 56 settlers, out of a total population of 8,000. It is safe to conclude that the sudden explosion in the number of armed men did not contribute to a democratic process. However, gun advocates claim, armed populations never have the chance to stop tyranny as they are disarmed first. There are many cases though where this is demonstrably untrue. Yemen is currently the second most heavily armed country in the world (per capita), and it is currently a battlefield between a Western dictatorship and various Jihadist organizations who have no love for a free State. Saudi Arabia and several other Arab countries are heavily armed, with what can only be described as tyrannical governments. Iraq before the 2003 US invasion is perhaps the best example. Saddam Hussein falls under any definition of a tyrannical dictator, yet the Iraqi people were very heavily armed with a gun culture mirroring that of the US. How armed a population is appears to have no empirical bearing on how free that society is. Along with reversing the likely causality, the idea that gun control leads to genocide is a pure example of post hoc ergo propter hoc (“after this, therefore because of this”). 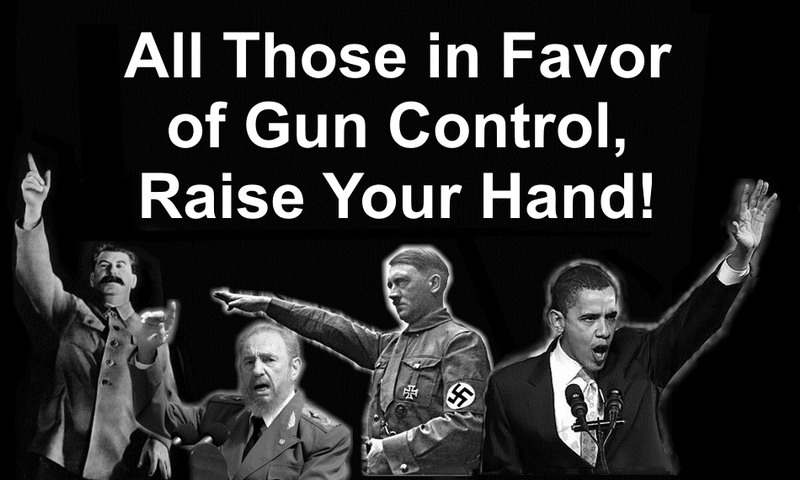 Oftentimes, the argument gun advocates advance is as simplistic as: name a dictator, claim he supported gun control. The entire process of determining which dictator did what quickly devolves into an exercise of historical whack-a-mole. 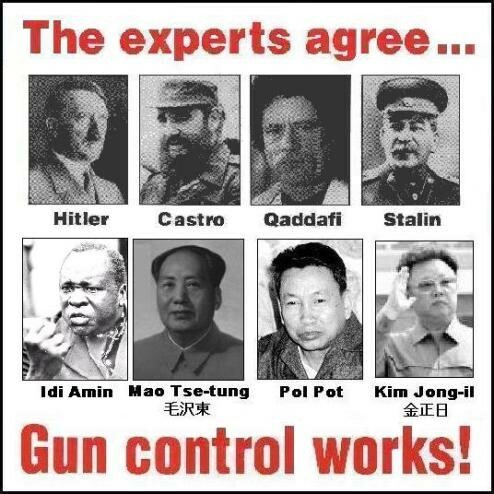 As there are dozens of dictators various gun advocates claim used gun control to disarm and then murder people, I will only focus on a few of the main tyrants. Regimes that haven’t engaged in genocidal acts (such as Cuba and Venezuela) will be excluded. Yes these countries have stiff gun control, but so does nearly every modernized country in the world, including England, Australia, Canada, France, Switzerland, Israel, etc. While Nazi Germany is not one of the examples provided by the widely circulated “A Little Gun History,” it is often the first alleged case of gun control leading to tyranny and genocide that gun advocates advance. However, like many widely circulated pro-gun quotes, this attribution is fake. There is no evidence that Hitler actually made these remarks. In reality, Hitler was relatively pro-gun. Most of the strict gun control was implemented by the Weimar Republic in direct response to rising street violence and to prevent an armed coup from either the Nazis or Communists. And to a small degree it was successful, as it prevented Hitler from seizing power by armed insurrection. The “gun control” law implemented in 1938, when the Nazis were fully in power, actually loosened restrictions on gun ownership. If the “armed populations prevent tyranny” maxim held, the Germans could have removed Hitler from office with relative ease. When presented with these facts, gun advocates typically reply that their theory still holds, as Hitler did do his utmost to prevent Jews (as well as Gypsies, homosexuals, Slavs, communists, and Jehovah’s Witnesses) from owning weapons. Therefore, if they had been armed, genocide could have been averted. However, the notion that small groups of armed Jews could have succeeded where the entire Polish and French armies failed is completely inane. It took the combined might of the US, Britain, Russia, and our allies to finally defeat Hitler and his allies. Comparing this reality to the Red Dawn narrative of armed resistance gun advocates offer highlights how little merit the “guns prevent tyranny” hypothesis has. The few instances of armed resistance such as the Warsaw uprising were quickly annihilated. The hypothesis that a heavily armed Russian population could have stopped Stalin and communist rule completely overlooks the massive civil war (1917-22) that culminated in the triumph of communist forces. Lenin and Stalin didn’t need gun control. They simply annihilated any domestic threats to their rule. As Omer Bratov, a historian from Brown University, explains about Stalin, “the very idea of either gun control or the freedom to bear arms would have been absurd to him. His regime used violence on a vast scale, provided arms to thugs of all descriptions, and stripped not guns but any human image from those it declared to be its enemies. And then, when it needed them, as in WWII, it took millions of men out of the Gulags, trained and armed them and sent them to fight Hitler, only to send back the few survivors into the camps if they uttered any criticism of the regime.” It also defies logic that where the military might of Nazi Germany failed, scattered bands of Russian resistance could have somehow succeeded. It is true that the Ottomans/Turks seized the weapons of many Armenians. But the Turkish government also took the Armenian’s right to speech, property, livelihood, etc. Anything the Turks could take, they did. Seizing their weapons was simply one of many tools used by the Turks to carry out genocide, not the cause. The idea that a better armed Armenian population would have stopped the genocide is naïve. Although some Armenians were able to hold out versus the government (with the help of the Russian military or French naval forces), most batches of armed resistance were annihilated with artillery bombardment and overwhelming military force. As the Armenian National Institute explains, while the armed resistance was noble, it was ultimately the International awareness and pressure on Turkey that saved the remnants of the Armenian population. Like the Russian case, the idea that Mao’s gun control allowed him to commit genocidal acts completely overlooks how Mao gained power in the first place: a massive civil war. If guns could have stopped Mao, they would have then, not at the height of his power. It also overlooks the fact that any type of gun laws would have had only a negligible influence of gun ownership as the vast majority of Chinese peasants (those bearing the brunt of Mao’s disastrous policies) were too poor to even consider owning a gun. Gun policy shouldn’t enter any meaningful discourse on Mao’s rule. The rationale for Guatemala’s wanton slaughter of the Mayan population was to eliminate the threat of Marxist rebels by removing their support base. Guatemala’s genocidal acts were a response to an armed threat, not an opportunistic assault to take advantage of a recently disarmed population as some gun advocates suggest. The tactics to remove this armed resistance, unfortunately, involved the slaughter of unarmed civilians, and was spurred by decades (if not centuries) of pent up racial tensions. It was the presence of armed resistance, not the absence of it, which led to further atrocities. The Ugandan case is a prime example of the post hoc ergo propter hoc fallacy in action. Gun advocates point to a 1970 Uganda law that restricted firearm ownership and regulated the types of weapons a citizen could own as the gateway to genocidal acts beginning in 1971 under the rule of Idi Amin. Had the population not been “disarmed,” the people of Uganda could have stopped the reign of terror. However, this analysis completely overlooks two very basic facts. First, the gun law implemented in 1970 was mostly an extension of a colonial firearms law dating back to 1955, meaning the number of gun owners would not have changed substantially. Second, the idea that the gun law was stage one of genocide is not viable, as the law was implemented in 1970 and Idi Amin did not seize power and begin killing people until 1971. Militias were largely ineffective in our own Revolutionary War. Militias in the modern era have overwhelmingly fostered tyranny, not liberty. Liberty and the degree of gun ownership in a society are uncorrelated. Even if they were positively correlated, the idea that gun control leads to tyranny is a post hoc ergo propter hoc fallacy. Even if this thought process wasn’t fallacy ridden, the historical examples gun advocates supply don’t hold up under closer scrutiny. Even if the historical cases displayed what gun advocates contend they do, the argument would still fail as applying the lessons from the examples to the US overlooks massive cultural and socio-economic differences.